Simple, because circumstances change. For example, your business may need to relocate, or there may be changes in the law requiring you to increases an employee’s wage. Any changes to en employee’s terms and conditions must be recorded. 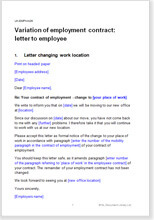 This document includes five letters of the most frequent changes to an employment contract. Of course they can be amended to suit other, less common variations too. Option for the employee to dispute the changes.